Have you and your children spotted any birds building nests this spring? A few weeks ago on my Instagram and Facebook pages, I posted a photo of the very early stages of a bird’s nest being constructed in a nearby tree. 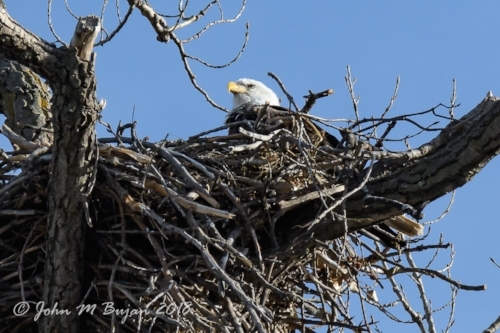 As serendipity would have it, that very same day my brother sent me this incredible photo of a bald eagle's nest near his daughter’s home in St. Paul. Here is another one! Below is a link to my recommended book list for kids on bird nests. I was able to check all of them out from my local library, but in the PDF I have included links to purchase the books online if you wish. For the past seven years, my brother, John, has been an avid bird photographer whose goal it is to document as many native Minnesota birds as possible. To date, he has successfully photographed 130 of the 311 bird species commonly found in the state. He says his birding photo sessions give him an excuse to hike, particularly during the long and often bitter Minnesota winters. Hmmmm . . . a lot like gardening with children! 😊 They and Mother Nature are usually the ones in control! What are the Benefits of Birds in the Garden? Watching birds and listening to their songs help to relieve stress and boost our sense of well-being, and heaven only knows both we and our children can use this nowadays! Being outside gives us the added benefits of vitamin D, increased physical activity as we prepare our yards for our feathered friends, and a healthy dose of fresh air and exposure to green spaces. Observing bird behavior opens up many learning opportunities for children to study local wildlife. Most children I know, including my grandchildren, love animals and science, so use this time of year to bolster their STEM skills (Science, Technology, Engineering, Math). Birds greatly contribute to our garden’s ecosystem. By turning our yards into bird-friendly places, we teach our children to care for Mother Nature’s creatures and respect the environment in which we live. 👍 So, thumbs up for birds . . . the only members of the animal kingdom with feathers to help them fly and keep warm . . . these beautiful egg laying vertebrates whose species number at least 10,000 . . . the graceful, two-winged creatures who fly, glide, and soar, inspiring us to do the same.